Around 1940 there were about 15.000 heads which decreased to 5.700 in 1960 until the sharp collapse to the number of 13 heads in 1983; at present there are only few dozens heads in the Magra and Vara valleys in the provinces of Massa Carrara and La Spezia. The destiny of this breed was determinated by the continuous crossbreeding of substitutions with the more productive Italian Bruna. In the Carrara area it was once applied to transport the precious marbles from the Apuane Mountains to the sea boarding. The bull has a dark golden red coat with a long light stripe along the dorsal backbone with darker shades on the head (with eyeshadows) on either sides on the neck, on the external part of the shoulders, on the frontal sides of the forearms and of the cannon-bones, on the coronary pad of the four limbs and on the lower part of the sides of the trunk. The wide muzzle is dark black; the head is quite light with a straight profile. The trunk is quite short with raised withers as compared to the dorsal backbone. 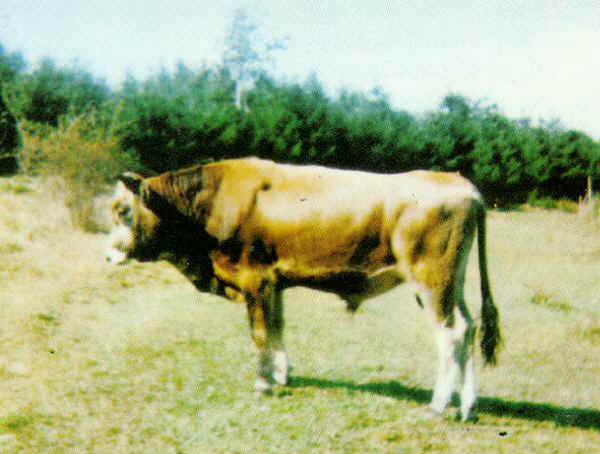 As to the cows, the coat is light golden red with slightly darker shades in the above mentioned parts in the bull. The head is a bit lighter and longer than the bull’s. Very rustic breed with quite good milk production.